In medieval Europe, a monk could spend years making a handwritten copy of a single manuscript, replete with elaborate artistic work. Gutenberg put an end to that as a viable publishing mechanism. Similarly, microfilm, microfiche, and CD-ROMs were swept aside as preferred storage mediums for information; legal and otherwise. I doubt your firm still has an up-to-date law library on site. Westlaw and Lexis saw to its demise. The last defensible redoubt of paper in law practice is note taking for meetings, phone calls, and the like. Pen and paper: it’s quick, easy, portable, and impervious to power failure. Most importantly, for me as an attorney, it lets me focus on the client or coworker; the content, not the technology. I can quickly capture important information, “star” or “highlight” phrases without obscure keystrokes, and draw any arrows or diagrams as needed. 1. Apple’s newest 9.7” iPad and Apple Pencil. In April, Apple launched its newest 9.7” iPad model. This iPad, starting at $330, is the first non-Pro iPad model to work with the Apple Pencil ($99). The Pencil is by far the best stylus available. Handwriting is recognizably yours and feels very natural. Combine this pair with the Notability app ($10) to get the familiar feel of writing with unlimited “pages” of handwritten notes, seamless cloud backup, synchronized audio recording of your meeting and notes, along with text searching of even cursive-written words. I love this setup because I get technology’s advantages without its burdens. 2. If you gawked at replacing a BIC and legal pad with $430 of tech, try Rocketbook, a smartphone-enabled reusable notebook. 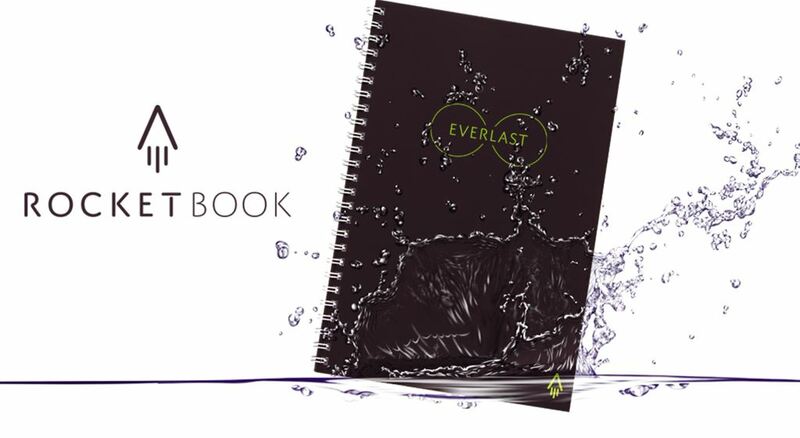 Rocketbook Everlast ($34), is a 32-page “wet erase” notebook that uses Pilot FriXion pens. Write whatever notes you want on the pages. When finished, select the cloud services where you’d like the notes stored by checking the appropriate box(es) at the page’s bottom. Snap a photo of the page with the Rocketbook app, and those pages are whisked away for storage in the cloud. 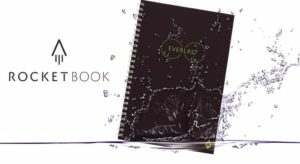 Once snapped and stored, wipe the notebook pages clean with a moist cloth, and it’s ready for another use. A colleague likes this tool because it forces her to act on the notes in order to erase them and reuse the notebook. 3. A third option utilizes Office Lens from Microsoft or the Dropbox app to save a PDF file of your notes to either OneDrive or Dropbox respectively. If you have Office365, Microsoft includes a terabyte of OneDrive space, or five gigabytes for free. Dropbox gives you two gigabytes for free. With either service, take handwritten notes as you’ve always done. Then open either Office Lens or Dropbox and “scan” each page of your notes by snapping pictures of them. Choose a name for the resulting PDF and upload it to the app’s cloud storage for safekeeping and distribution. Please try these three ways to digitize your notes without the weight of obstructive or distracting technologies interrupting your meetings. As an added benefit, all of them prevent you from accumulating an indecipherable pile of half-used legal pads, whose notes are easily lost, forgotten, or destroyed. Give them a try and let me know how they work, or what you use instead. If you’re interested, let me know and I’ll write a future column on integrating these tools with document management systems so your notes can flow into your electronic case file. the reason I take notes on my Ipad with the key board, is my failure to pass handwriting 101.